THE Giving Tree is an amazing pictorial book written and illustrated by Shel Silverstein. Once there was a tree … and she loved a little boy. Everyday, the boy would come, gather her leaves, make them into crowns and play king of the forest. He would climb up her trunk, swing from her branches and eat apples. When he was tired, he would sleep in her shade. The boy loved the tree very much. And the tree was happy. “I’m sorry,” said the tree, “but I have no money. Take my apples, Boy, and sell them. Then you will have money and you will be happy.” And so the Boy climbed up the tree and gathered her apples and carried them away. And the tree was happy. But the Boy stayed away for a long time, and the tree was sad. And then one day, the Boy came back. And so the Boy cut off her branches, carried them away to build his house. And the tree was happy. But the Boy stayed away for a long time. When he came back, the tree was so happy she could hardly speak. And the Boy did. And after a long time, the Boy came back again. “I just want a quiet place to sit and rest. I am very tired,” said the Boy. “Well, an old stump is good for sitting and resting. Come, Boy, sit down. Sit down and rest.” And the Boy did. And the tree was happy. The relationship between the tree and the boy, as a child, would be interpreted as God or parents giving their children unconditional and selfless love. As one grows up, one will question the abusive relationship between the tree and the Boy. Ellen Handler Spitz, who teaches in the Department of Art and Art History at Stanford University was critical, describing The Giving Tree as over-rated, presenting a paradigm for young children a callously exploitative human relationship across genders and generations. The author of Inside Picture Books contended that it perpetuates the myth of the selfless, all-giving mother who exists only to be used and the image of a child who can offer no reciprocity, express no gratitude, feel no empathy an insatiable creature who encounters no limits for his demands. Such mother-child relationship is paradoxical and tragic. But thankfully, the majority of humankind grows up and the motherly love is passed on to the next generation. Reaching 35, with a family and children to provide for, we will learn to appreciate the unconditional love of our parents as we turn providers of such motherly love. At 65, many of us will sit back to appreciate the parental love we had received to make us what we are and fulfilled that we have provided. 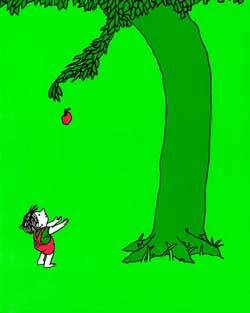 But The Giving Tree is also warning and reminding us of one of the biggest human frailties – greed. And it is not denying that there are those who suffer human frailties more than others, digging into the bottomless pit of greed which exhausts the providers in an endless effort to satisfy one’s need without ever reaching satisfaction. The sense of exasperation gripping the country now has brought me to wonder about the exploitative relationship our leaders have with the giving nation and the giving people. The abundant resources, bestowed upon us no longer satisfy our needs, the enormous corporate and personal taxes imposed on higher disposable earnings are now short of feeding our appetites. The leaders have decided that we must now tap into the expenditures of all, rich or poor. It may be true that 160 countries in the world impose GST but how many of those countries are comparable to us in terms of endowment of natural resources? How many of them have such huge disparity in income earnings as our folks? How many of those countries have such big disproportionality of folks living from hand to mouth? How many of their country-families suffered 140 per cent household debts compared with disposable incomes? How many of those countries suffer our enormity of wastages, leakages and mismanagement of public funds? Sad to say, not many Sarawakian families can afford to spend additional RM140 each month, the amount that an average Malaysian household has to bear with the imposition of GST. While many are feeling the pinch of the flat rate tax, the poorer families will be poorer and their living standards will be worse off. It is completely wrong to look at taxes chiefly from the point of increasing revenue for the country. Everybody knows what the Auditor General implies when the words “leakages, “wastages” and “mismanagement” are used in the reports. It is even more telling when such discrepancies are identified in their audit of the Finance Ministry, the very Ministry supposedly taking charge of the country’s coffer. The answers are still wanting, for the RM42 billion debts, suffered by 1MDB, a company, owned by the Finance Ministry. Similarly, the Pembinaan PFI Sdn Bhd, another company incorporated by the Finance Ministry, has reportedly accumulated liabilities of RM27.9 billion at the end of 2012. The company had taken up a RM20 billion loan from the EPF, chiefly to lease land from the Federal Land Commissioner and then lease the land back to FLC who pays rental to the company. The AG’s Report of 2013 had shown RM18.6 billion from the original RM20 billion loan from EPF had been spent but only RM1.2 billion were accounted for. Where is the rest of the money? Further, SRC International Sdn Bhd, formerly a subsidiary of 1MDB and now directly under the Ministry of Finance, is also accused of leakages and mismanagement. The company owed the Malaysian pension fund KWAP RM3.81 billion in Islamic loan. The Finance Minister’s scanty answer in this current parliamentary session created doubts and has led journalists to investigate and enquire into the company’s investments and found that less than RM50 million may be accounted for, but the whereabouts of the RM3.805 billion ringgit borrowed remains in doubt? I am most certain that Sarawak and Sarawakians do not enjoy any benefits from the “enterprises” of 1MDB, Pembinaan PFI Sdn Bhd or SRC International Sdn Bhd but all Sarawakians are now over-burdened with the regressive tax which is imposed evidently to cure the wastages and leakages. What more can you get from a tree that is reduced to a stump?